Download our free app and start your mindfulness journey today. We offer programs for a range of programs for both children and adults, designed to assist you in dealing with the pressure, stress and challenges of daily life. 10 minutes a day is all you need to see real changes. What are you waiting for? Download the app now and see for yourself! Try a session online now! Smiling Mind aims to build happier, healthier and more compassionate people. Smiling Mind builds, supports and develops healthy minds at all stages of life. Developed by psychologists, and based on mindfulness meditation techniques. This program is designed to support teenagers as they plan for the future. This program is designed to support teenagers as they transition to high school and make new friends. This program is designed with an understanding of the power of thoughts and the importance of treating each other with respect as children take on leadership roles at school. This program is designed for young children who are learning new social skills, new ideas and who they are as they learn independence from parents and family. The Smiling Mind Education Programs are mapped to the national curriculum and designed to support educators to bring mindfulness into the classroom. This program was developed in partnership with Cricket Australia to complement regular sports training. Programs developed in other languages to support our vision to help every mind thrive. Download the NPY resource here. 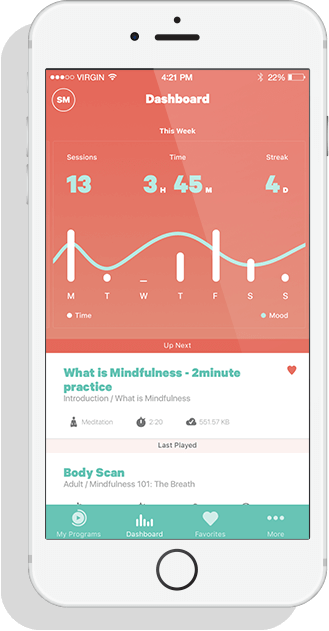 Developed with beyondblue, Mind the Bump is a free Mindfulness Meditation App that helps individuals and couples in preparation for having a baby and becoming a new parent.